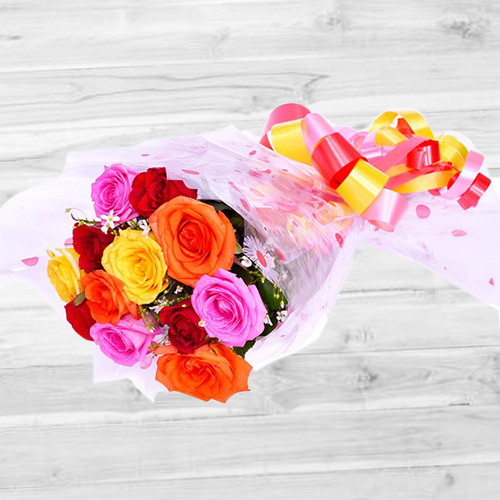 Wishes are delivered in the most stunning way by gifting this Always and Forever Rose Bouquet for lovely people in a lovely way. This Bouquet is decked with 10 Mixed Roses. Flowers Delivery Latur, Send sweets Agartala, Wedding Cake Khammam, Diwali Mithai Kanpur, Send Flowers and Gifts to Nagaur, Online Shop Kurnool, Flower to Hubli, New Year Flowers Shencottah , Fresh Fruits Mumbai, Send Gift Silvassa, Dry Fruits to Renigunta, Birthday Delivery Pratapgarh, Sending to Gulbarga, Flower shop Hanumangarh, Cochin Online Cake Delivery.